Clicking on the image will enlarge it into a lightbox. Just like most kids, Tali began playing the recorder in 2nd grade. Unlike most, she never stopped. A student of Bracha Kol, Tali has been professionally trained in classical baroque and renaissance music from a young age. She studied in prestigious music institutions in Israel (Thelma Yellin High School of the Arts, Rimon School, The Buchmann-Mehta School of Music) and received scholarships and prizes (AICF Scholarships 1994-2006, 2nd prize at the International Recorder Festival Contest in Utrecht, Gilad Shein Memorial Scholarship). Tali later received a full tuition scholarship to attend Berklee College (Boston), and became the first recorder player ever to study there. She was chosen to represent Berklee at the John F. Kennedy Center for the Performing Arts, Washington D.C. , and upon graduation, received the W.S. Kenney award for outstanding achievement. In the recent years, Tali has been collaborating with multiple Grammy Award winning producer Javier Limón on several projects, including: "Tal y Tali" (together with pianist Tal Even-Tzur), "Promesas De Tierra" (with musicians from Palestine, Spain, and Israel), and on the 2015 Latin Grammy Award winning album "Entre 20 Aguas" (alongside Chick Corea, Dhafer Youssef, Michel Camilo, Chucho Valdéz and Alejandro Sanz). In fall 2017 Tali will be joining the “Flamenco Legends” tour by Limón and IMG Artists, with Paco de Lucia’s original band. Tali has collaborated with world-renowned musicians: Latin superstar Alejandro Sanz (in the 14th annual Latin Grammys), Anat Cohen, Tomatito, Alain Mallet (former member of Paul Simon's band) Emil Zrihan, Jamey Haddad, Shedrick Mitchell (formerly Whitney Houston’s pianist), El Piraña, Diego del Morao, Josemi Carmona, Alain Pérez, and others. Israeli leading artists she has played with include Yoni Rechter, Idan Raichel, David Broza, Dan Toren, Dana Berger, Miri Mesika, Ariel Horowitz, Shimon Buskila, Ilanit, Mark Eliyahu, Ilay Botner, Lea Shabbat, Kobi Aflalo, Dudu Fisher, and Knessiat Hasechel. Tali has toured in the US, Canada, Israel, The Netherlands, Spain, Germany, France, Denmark, Taiwan, The Philippines, Chile, Uruguay and Poland. Major festivals she performed in include: Israel Festival (Jerusalem), Tri-C Jazz Festival (Cleveland), First Night Festival (Boston), International Recorder Festival (Utrecht), Asian Recorder Festival (Hsinchu), Méditerranée Festival (Ashdod), Copenhagen World Music Festival, Festival Músicas del Mundo (Santiago), Festival Jazz a la Calle (Mercedes), Taichung Jazz Festival, and Sopot Jazz Festival. She has performed as soloist with The Israeli Andalusian Orchestra, the Manila Symphony Orchestra (Philippines), and the Orchestra of Saint Luke's ("Link Up" concert series at the Carnegie Hall). Currently, Tali is working on her third album, as singer-songwriter, which will be produced by Limón and released in Spring 2018. 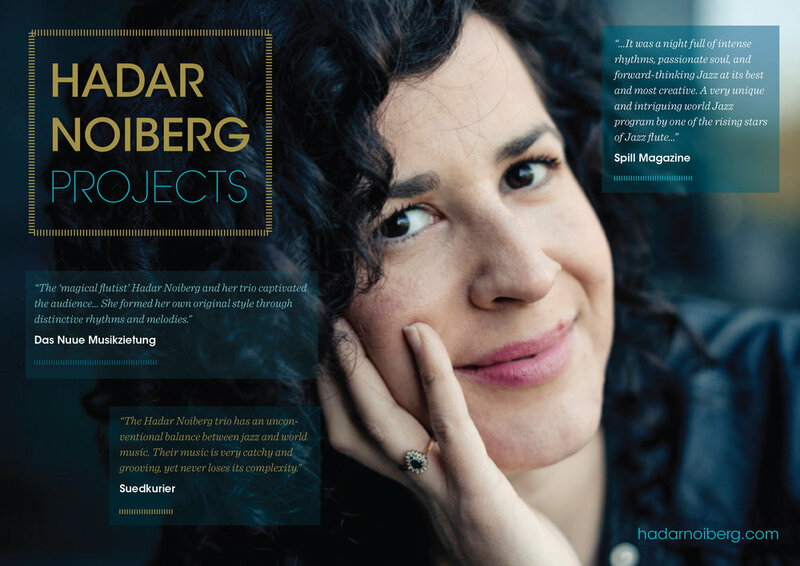 Hadar Noiberg’s NY based trio has had tremendous success performing in major festivals all over the world. The trio is a ‘Power Trio’- tight, full of groove and passion. The daring and unique instrumentation of flute, double bass and drums allows sliding in and out of mainstream Jazz and western harmonies with Middle Eastern and North African rhythms and semitones. The music of the trio is very melodic, fresh, spunky and boundary pushing blending simple «folky» melodies with intense development, soloing and communication. The trio has just recorded its third album which will be released this April followed by CD Release tours in Europe and the US. - The trio will play the music from its new CD for the FIRST time in the Jazz series! - This will be the last show in NY for a while before the trio goes to tour in Europe for CD release concerts.